Large pores can be any makeup lover’s worst nightmare. Imagine, applying the perfect shade of foundation on your face when, all of a sudden, your pores noticeably look bigger, completely ruining your look. And no, contrary to what some might be led to believe, applying more makeup to hide these pores won’t do you any good. In fact, more makeup will highlight your large pores even more. To make matters worse, large pores are genetic, and you can’t really do much to shrink them physically. So how can a determined makeup lover possibly achieve that gorgeously flawless finish with such a disadvantage? How can anyone expect to pull off a fabulous makeup look when you can’t even put on foundation without magnifying your large pores? Fortunately, there are now modern solutions to help temporarily hide your pores. Besides a meticulous skincare regimen – exfoliating twice a week and using the right products can seriously help – makeup artists and experts all agree that the trick to getting superbly smooth skin despite your large pores is finding the right makeup primer. To give you an idea on where to start, we’ve collected a list of makeup primers that a lot of people with large pores swear by. This primer is a particular favorite among makeup lovers. The POREfessional Face Primer is very popular for its lightweight feel as well as its smooth texture. This is the kind of primer that sets into your skin quickly. The POREfessional Face Primer contains vitamin E which is great for healthy skin, not to mention an anti-aging ingredient. Moreover, this makeup primer will not just fill your pores but also complement all skin tones since it comes with a little tint. Even with just this primer on, you’ll get that fresh and natural look. Makeup gurus swear that their skin looks practically airbrushed with this primer. 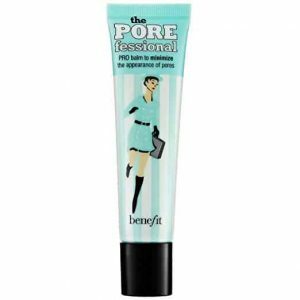 Benefit’s POREfessional Face Primer hides your large pores so that your face looks nice and even. However, the only drawback here is that it’s not the best at combatting oily skin. If you’ve got particularly overactive pores, this might not be the right primer for you. The POREfessional Face Primer is better suited to normal to combination skin type. You might notice that NYX Cosmetics Pore Filler comes in a pretty small tub. But you only ever need to use small amounts of the product to a small and affordable tub will last you a long time. 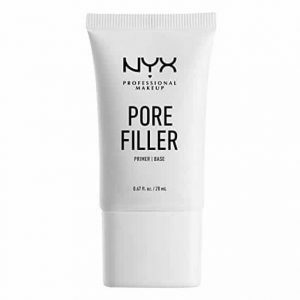 NYX Cosmetics Pore Filler has a peachy tint, but you don’t have to worry about it clashing with your skin tone or foundation. The light color fades out after it dries. You’ve probably already heard of Becca for their famous Shimmering Skin Perfector. Well, their Ever-Matter Poreless Priming Perfector is getting a lot of attention for its shine-control. This primer is water-based, so it’s incredibly lightweight and perfect if you prefer water-based foundations, concealers, and other products. Priming Perfector might feel a tad thick for a primer. But when you apply it on your warm skin, it eventually melts and leaves a powdery finish. You’ll want this primer if you’re a fan of a nice mattifying product. A lot of people have considered Becca Ever-Matte Poreless Primer as a blotting paper in a tube. It targets the major areas of your face that produces sebum so, oily skin type gals, rejoice! This primer has got your back! And as an added bonus, it promises a 12-hour oil-control. A word of advice, never skip your face moisturizer before using this primer. On unmoisturized skin, the Ever-Matte Poreless Primer has a tendency to flake since it’s incredibly absorbent. Moreover, its oil absorption power can be a detriment on normal skin. But as long as your skin is properly moisturized, this primer should work like a dream. This silicone-based primer is perfect for those with large, open pores. It has a thicker consistency that results in a powdery finish. The Smashbox Photo Finish Foundation primer gives your skin a smoother texture and reduces pores for up to eight hours. It is recommended to use a liquid foundation with this primer since it blends very impressed with that type of makeup. And because it’s silicone-based, it’s a lot more water resistant than other primers. Sweat and humidity are no match for the Smashbox Photo Finish Foundation Primer. If you’re looking for a primer with additional skincare benefits, theBalm’s TimeBalm Face Primer is packed with vitamins that can repair and even out your skin tone. If you’ve got stressed skin, this primer also has allantoin and bioflavonoid which are anti-inflammatory ingredients perfect for soothing your skin. This face primer has a thin consistency and can minimize pores, wrinkles, and lines immediately. TheBalm TimeBalm Face Primers works great for oily skin type even in the summer. There’s a good reason why you’ll find the Hourglass Veil Mineral Primer in almost every makeup artist’s bag. This is a primer with a unique formula that is best for people with acne-prone and sensitive skin. And if you’re worried that the Hourglass Veil Mineral Primer’s sun protection ingredients mean that it’s greasy or tacky, rest assured that it’s not. It’s lightweight and even mattifying. This primer minimizes pores and conceals wrinkles. And it doesn’t clog your pores either. The Hourglass Veil Mineral Primer has an airy and smooth texture that takes care of your large pores and protects you from harmful UV rays. What more could you wish for? Here’s a primer that can fill large pores but can work for either oily or dry skin. Too Faced Primed & Poreless is a gem for people with combination skin. It might have a thick texture, but it disappears on your skin once it’s applied. This primer has a dose of vitamins A and C, retinol, and mulberry extract. Not only does it minimize your pores but it also gives you a radiant glow. However, retinol can be photosensitizing meaning you need to pair this primer with a good sunscreen. Finally, we have the LORAC POREfection Mattifying Face Primer, a long-wear and mattifying primer that’s more of a skincare product than makeup. This primer is formulated to keep your face shine-free for hours. It minimizes large pores and works for all shades of makeup. LORAC POREfection Mattifying Face Primer will work wonders for acne-prone skin because it’s infused with salicylic acid and antioxidants. Oily skin type will definitely love this oil-free, paraben-free, and fragrance-free primer. For those with sensitive skin, on the other hand, you might need to be a little careful. You might be reactive to this primer’s ingredients. Do a patch test before using this primer just in case. For a lot of people with large pores, the primer is the magic cream, liquid, gel, or even powder that can serve as a base for makeup foundation. Makeup artists, skincare experts, and even regular makeup fanatics adore using a primer before any other makeup product. However, a lot of people don’t truly understand how much of a game changer wearing a primer underneath your makeup can be. Some people don’t even bother with this step because they don’t feel like it’s all that necessary. After all, why would you need to wear makeup to keep your makeup in place? It sounds pretty redundant, and when you’re rushing to work, you don’t exactly want to waste time applying what essentially appears to be another layer foundation. If you’re still dubious as to a primer’s necessity in any makeup routine, just know that a primer actually gives you an additional layer between your skin and your makeup products. This means that no matter what kind of product you apply on your face, your skin will appear smooth and evened out. Plus there are countless other benefits to wearing primers. Most primers provide additional hydration to your skin. There are also primers that have anti-aging properties as well as sun protection. Once you try it, you immediately notice how much smoother and more natural your foundation appears. Moreover, primer lets your makeup last longer which is just what you’ll need if you’re out all day. Even if you’re not going for a full coverage makeup look, wearing primer should still be part of your makeup routine so you can avoid unwanted shine or grease on your face. Makeup savvy gals afflicted with large pores in particular need primer to prep their skin before applying anything else. The primer will fill in your large pores so the foundation will stay on your skin evenly. Some primers are even formulated specifically to minimize pores. These heaven-sent products can blur your large pores so they won’t dominate your look. Large pores are pretty prone to be clogged. This happens when sebum, dead skin cells, or even dirt get stuck on your skin. If you’re wearing plenty of makeup the whole week, you’re at risk of getting clogged pores. And the more your pores are clogged, the larger the pores get. Dirt and debris can stretch your pore holes and, unfortunately, once they’re stretched they’re physically impossible to revert back to normal size. The nightmare! And that’s not even talking about breakouts and acne. Ladies with large pores often have to worry about foundation filling their large pores. However, it’s important to note that most foundations generally can’t go deep into your skin if you apply primers beforehand. Primers will serve as a healthy pore filler so you can wear foundation without getting anxious about clogged pores. Another thing that people have to deal with when they have naturally large pores is the oiliness and the greasiness. People with large pores generally have an oily skin type. A common misconception among oily skin babes is that they had to keep their face dry and mattified to keep the sebum at bay. On the contrary, the drier your skin gets, the more oil your sebaceous glands secrete. That’s why you cannot neglect to moisturize your skin. If your face is well hydrated and moisturized, your sebaceous glands won’t have to work overtime anymore, saving you all the trouble. Fortunately, primers generally come with moisturizing properties to ensure that your face doesn’t get dried underneath all your makeup. With primers, makeup lovers with oily skin won’t have to fret about all that terrible grease that comes with having large pores. Instead, you’ll look fresh and radiant all throughout the day with a primer keeping a protective barrier over your skin. Similar to makeup foundation, there are different types of primer, each specified to a certain skin type, concern, or function. Finding the right primer for you is crucial, especially if you’ve been struggling with large pores. The perfect primer will even out your skin, conceal any skin imperfections, and make sure that your makeup will stay on no matter what time of day. While there are plenty of primers in the market, they are all formulated to have different strengths and functions. What seems to work for one may not necessarily work the same way for someone else. There is no one true primer that will work best for everyone. You have to consider your skin type and what you need. That’s why it’s important to know the general types of primers and their benefits to give you an idea as to what to look for. Let us discuss the three basic types of primer based on their ingredients: water-based, silicone-based, and oil-based. This type of primer is the more lightweight of the three. As the name suggests, it contains water as its base as well as other ingredients. Typically, a water-based primer is more comfortable to wear since it has an almost weightless feel to it. This type is great for oily skin since it’s so refreshing and natural. You won’t feel like you’re face is packed with too much product, even with a full face of makeup. For those with larger pores, experts suggest that silicone-based primers are the ideal. They have a thicker consistency and can really smooth out your large pores. This type of primer can also conceal acne scars, wrinkles, and fine lines. Silicone-based primers have a noticeably different texture from water-based primers, though they also usually contain water for its consistency. This type of primer can prevent makeup from fully sinking into your skin thanks to the silicone molecules. Of course, when you have a silicone-based primer, it’s best if you pair it with silicone-based foundation. This is a lesser common type than the previous two and is generally not recommended for large pores and oily skin types. Oil-based primers are better for dry skin since they are more hydrating than any other type. For oily skin, on the other hand, it can make you feel too oily and uncomfortable. At the end of the day, when you have large pores and oily skin, you have two ideal options when it comes to choosing your primer based on its ingredients. You can either choose a water-based primer or a silicone-based primer. Both have their pros and cons. For water-based primers, their main selling point is their ultra lightweight feel. Oily skin gals usually prefer to avoid having that greasy feel that silicone-based primers tend to leave. However, when it comes to filling in enlarged pores, it’s silicone-based primers that are the real champ. Moreover, silicone-based primers are, to some degree, water resistant so even when you sweat or leave the house without an umbrella on a rainy day, it will stay on your skin much better than water-based primers. The latter type of primer, like all water-based makeup, is formulated to be easy to remove with water. So if you’re a makeup gal on the go, better choose a primer that can keep up with your active lifestyle. On the other hand, some people argue that silicone-based primers can actually end up clogging pores which not only means breakouts but also stretching your already large pores. You don’t have to worry about this kind of problem with water-based primers. But experts do say that as long as you properly wash off all of your makeup at the end of the day, silicone-based primers should be just fine to use. So which is the better option? Water-based or silicone-based? Ultimately, it’s all up to you. As mentioned previously, there are a lot of different types of primers, and each of them is formulated to a certain type of person. If your pores pose that big of a problem, silicone-based should be more up your alley. However, you should also note that not all silicone-based primers are formulated for oily skin types, so you need to consider other factors before committing to one specific primer. There’s a reason why primers have skyrocketed to fame in such a short amount of time. Makeup primers have an endless list of benefits and, more to the point, there are primers for basically every skin type and every concern. This wide variation means that primers need to be in every makeup lover’s makeup bag. It doesn’t matter if you’ve got dry skin or oily skin or even combination type. There’s a primer out there for you! You might be wondering then what kind of primer you should look out for when you have a specific skin type or skin concerns. Well, here’s a quick guide on what kind of primer you’ll need based on your type of skin. If your facial skin is noticeably dry with a tendency to flake, what you need to stock up on is a primer with excellent hydrating qualities. When you have dry skin, keeping your skin moisturized all day is of utmost importance. A hydrating and moisture-lock makeup primer can give you that refreshed look 24/7. On the other side of the spectrum, when you have oily skin that needs some serious sebum control, a mattifying makeup primer should do the trick. Top it off with a setting spray, and you’re good as gold. A decent mattifying makeup primer will be your best friend on hot and sweaty days. If you feel like your skin lacks radiance and color, there’s an excellent array of illuminating primers in the market that can give your face a brightness boost. These types of primers have reflective particles that will give you that all over glow even without having to use a highlighter. Additionally, even if you’re not feeling up to wearing a face full of makeup, putting on only illuminating primer will be enough for you to look dazzling. If you’re having trouble with red skin or just an uneven skin tone, a color-correcting primer can change your life. It’s going to take a little bit of trial and error to find the right tint of color-correcting primer that will go with your skin color, but it will be so worth it to have a nice and even base for your makeup. Makeup primers aren’t just limited to giving your facial skin that smooth, flawless, dewy finish either. There are primers with a wide array of benefits from brightening, pore-minimizing, blurring, anti-aging, hydrating, and long-wearing. Plus, some primers are even formulated specifically to protect your glammed out a face from harmful UVA and UVB rays. This type of primer is ideal for ladies aiming for that no-makeup look. A brightening or illuminating primer will blend your foundation naturally to your face. You can choose to apply it all over your bare skin or just on the high points of your face (nose, brows, cheeks, Cupid’s bow). If your skin is feeling exceptionally well behaved, you don’t even need to wear foundation over an illuminating primer to liven up your face. Large pores can be a major pain when you love wearing makeup. More often than not, your pores will dominate your look which is why pore-minimizing primers are a major lifesaver. While they can’t actually reduce the size of your pores, they can make your pores less noticeable. Moreover, pore-minimizing primers are also mattifying which is great since people with large pores tend to have oily skin as well. Say goodbye to ugly pores and icky grease with this type of primer. Have you ever wished photo filters could be worn in real life to hide your facial flaws and lines? Well, blurring primers are the closest thing you can get. This type of primer can give you that soft focus effect that can make it easier to hide whatever you want to hide. You can create a real-life airbrushed look with a blurring primer. When it comes to any anti-aging makeup product, the rule of thumb is that it’s better to start early than late, especially for those who spend a lot of time out in the sun. Nothing causes wrinkles faster than prolonged exposure to sunlight which is why anti-aging primers have both protective and reparative qualities. This type of primer is packed with SPF to protect your skin from UV damage and anti-aging ingredients like peptides and niacin to make your skin healthier in texture and tone. 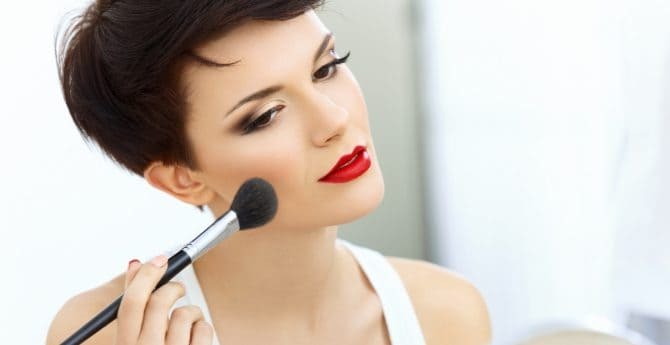 Applying makeup on dry skin can be pretty challenging since there’s always the risk of your foundation settling into dry or rough areas of your skin. You might end up highlighting just how dry and flaky your skin is if you’re not careful. If you have this problem, you’ll need a good hydrating primer to ensure that your face will stay moisturized and fresh even under full makeup. A hydrating primer will give you the perfect base for your makeup so no product will settle on dry patches or lines on your face. With this type of primer, you won’t ever have to hesitate whether you should go full glam or not. Your dry skin won’t stop you from living your best beautiful life. While it’s true that all primers are essential to ensure that your makeup stays on your face, a long-wearing primer is specifically formulated for extended periods of wearing makeup. This type of primer will lock in your makeup all day so you can do whatever you want and not have to worry about your foundation fading. When and How to Apply Makeup Primer? Now that you’re more familiar with the different benefits and types of primers let’s move on to applying primers on your skin. After all, primers are essentially makeup products, and you need to know when and how to apply them to get the full effect of the primer. Before makeup primers were popular, makeup lovers used to wear layer after layer of foundation to have the illusion of smooth and refined skin. Ladies with large pores, acne scars, or other skin flaws usually relied solely on foundation back then. The problem with that method though is that pushing layers of foundation (or any other type of makeup) on your face typically leave you with an unnatural and uneven base. Moreover, wearing so much product inevitably strains your skin and your pores. It leads to breakouts and other concerns in the long run. Foundation isn’t designed to penetrate that deeply into your skin. It isn’t meant to conceal large pores or imperfections either. And no matter how hard you try, the foundation just won’t stick on your skin for the entire day without a little bit of help. Obviously, finding the ideal primer that suits your skin type and caters to your specific needs is the first step in this process. Next, you need to learn how to apply makeup primer properly. Regardless of skin type, before anything else, you need to make sure that your skin is clean. Wash your face with your choice of facial wash. If you have oily skin, the right facial wash or cleanser is crucial to avoid early sebum buildup. Speaking of oily skin and large pores, you need to avoid oil-based products at all costs. Not only would your face feel greasy and slick, oils actually reflect light which means that your skin’s uneven texture and large pores will be highlighted. Before applying makeup primer, you need to apply moisturizer on your face. This is the first rule of primers, even if you choose to wear a hydrating primer. Moisturize your bare face completely and wait for at least five minutes. It’s important that you don’t rush into applying primer. Your moisturizer needs to settle into your skin so that when you do apply your ideal primer, it will be absorbed completely. If you’re in too much of a hurry and apply primer on your recently moisturized skin, the primer won’t work half as well, and your foundation will likely break up and crack into patches easily. When your face is finally clear of any traces of moisturizer, you can now apply primer. You need to start not from the bottom of your face like you would normally do with face moisturizer but from the center of your face. Gently work your way outward, making sure that you cover every nook and cranny on your face. Take note that you’re aiming for light coverage with primers. Some experts and makeup gurus recommend using a sponge to apply primer but using your fingertips will give you more of an advantage. For one thing, sponges have a tendency to absorb the product while if you use your fingers, you’re guaranteed to make use of every drop of your primer. Another thing is the heat from your fingertips will facilitate in spreading the primer much better than with a sponge or a brush. Press and pat the product on your skin gently until you’re sure that you’ve covered every inch of your face. It’s important to remember to never rub the formula since rubbing it will just ball up the product before it can set into your pores. While it’s important to apply primer all over your face, you also shouldn’t overdo it. Over applying your primer won’t help keep your foundation or concealer stay on longer. On the contrary, too much primer will cause your makeup to slide off sooner and quicker. Additionally, take care to avoid the eye are. A small drop is enough for a thin layer over that area. Once you’re satisfied with your application, let the primer sit for a few minutes before moving on to a foundation and other makeup products. If you thought primer was just another simple step in your skincare and makeup routine, think again. To really enjoy the full benefit of this magical product, you need to take time and pay attention to how you put on a primer. And since primer can make or break your makeup look, knowing how best to apply the product is absolutely crucial. It’s worth repeating that not all makeup primers are equal and what works for one may not necessarily work for another. Usually, you need to try out a few types of primers before you can find the right one that is best for your skin.